How do particular communities change due to migration processes? How can we merge into the daily life of different ethnic groups, to get to know and to better understand it? In what kind of impact do closer relations result and what kind of responsibility they imply? What kind of potential is there for collaborations between social researchers and artists in this field? 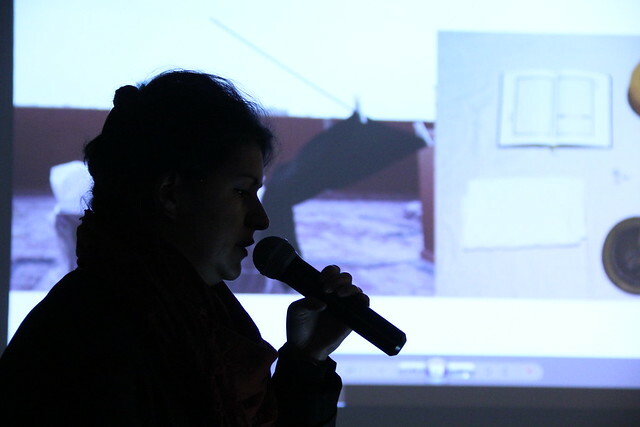 In the first part of the discussion Rita and Ksenia will present their projects and approaches, and then we'll discuss the possibilities of collaborations between Kaliningrad artists and researchers studying the processes of migration in the Kaliningrad region. Rita Sanders considers these issues as an anthropologist and social researcher. She focuses on migration processes, cross-ethnical interactions, social networks, issues of identity, notions of border, home etc. She lived for a long time in Kazakhstan, where she worked on her dissertation thesis Why Did They Stay Behind? Identities, Memories, and Social Networks of Kazakhstani Germans in Taldykorgan/Kazakhstan. At the moment she is planning to launch a long-term research project Migration and memory in the Kaliningrad region. Ksenia Diodorova is a documentary photographer, creative director and co-founder of visual communication studio and school Gonzo Design, author of independent long-term multimedia projects In the Cold, Dreams Behind the Hijab, Seventh Place. Parallel Program, In_Inbreathe. In January 2014, she went to the Pamir Mountains in Tajikistan and spent a month there filming the life of Bartang valley and its inhabitants. Having returned to Russia, she started looking for close relatives and children of her subjects from Pamir, who left for Russia to earn a living. She met them and made take portraits of them. "What came as a result was a two-side story, through which we can get to know more about migrants or even start from scratch — to see where they were born and how they grew up, who their parents are and what their children draw, in what they believe and what they dream about".